BoyRaket.com: Tree Top Adventure Baguio - Conquer Your Fear of Heights! Tree Top Adventure Baguio - Conquer Your Fear of Heights! Not the usual theme park that we're used to, this adds a little adventure as far as heights and activities that you will love. Guests can choose from the extreme to the less and more relax activity/ride depending on what you can handle. 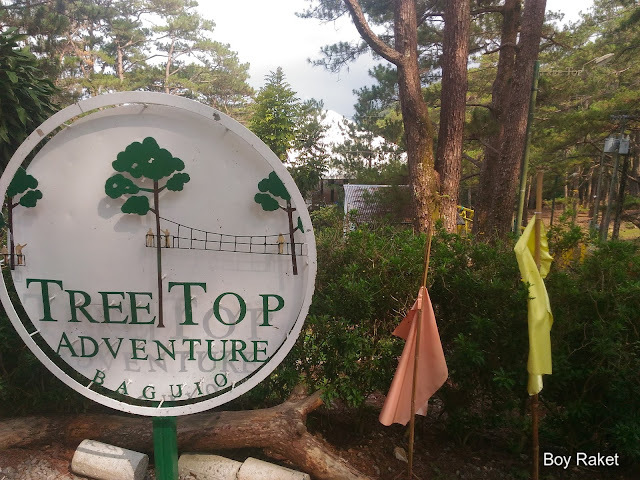 Tree Top Adventure Baguio is in the heart of Camp John Hay just next to Hotel Manor and the other attractions in the Golf Course. Upon arrival, guests will get a briefing on what's allowed and not allowed in the premise. Above are arranged from the most relax to the most extreme order. Trekking is quite relaxing because you can to walk to a cliff like trail and be one with nature surrounded by pine trees, and on Skywalk it will be a level higher. Literally, there is a view deck for you to get a better view of what's on top, like your on top of the tree. It will be a nice backdrop for your selfies. Functional Ride is a little cute I can say, because it is just like being in an escalator, only you are sitting. Guests will be sitting in the ride and will be pulled up, then slide back down(slowly). Canopy, for me is scary(only when looking down) in a way that you'll be above the ground for a few minutes hanging in the air strolling next to the trees but getting a pretty good view while chatting with your other 3 friends. Silver Surfer, for me this is a little nerve wrecking, maybe because it is my first time but anyway, the challenge there is staying and standing still because the ride will not be bumpy, but shaky so every time it stops in the middle you better hold your ground. Well, I still like it! Tree Drop Adventure, well..most of the other guys wasn't able to try this due to the fact that you'll be dropped from 60feet high. To give you an idea about it. Imagine the drop ride from a theme park in laguna, almost the same feeling but this time instead of sitting you are looking at the ground. Surely this will be the longest 2 seconds of your life! Overall, as a person of adventure this is highly recommended. Nature and adrenaline adventure for you, most specially for me that likes to conquer my fear of heights.